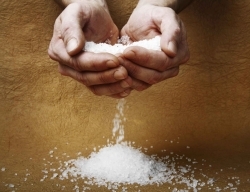 Salt has been one of the most misunderstood minerals in the human diet. You constantly hear that salt leads to high blood pressure, bloating, thick blood and a whole host of other conditions. This may be so, but for Action Sports athletes, it is one of the most critical parts of your diet if you are to train and compete at your highest level. Before I get into recommendations on just how much salt you need in your diet, lets take a real brief look at how salt gets processed by your body. Salt or Sodium Chloride (NaCl) is classified as an essential electrolyte, meaning it dissolves in water and its parts can conduct an electrical current. When eaten and digested in the presence of water NaCl gets broken down to NA+ and Cl- and become critical in fluid balance and performance of your muscles. Sodium (Na+) plays a balancing act with potassium (K+) in the human body together forming the Sodium Potassium pump that fuels nerve impulses and is a major factor in fluid balance and hydration. If you don’t eat enough sodium or loose too much of it from sweating during those hot training and race sessions, your body naturally tries to compensate to keep the balance between sodium and potassium. This is when your body releases hormones like Aldosterone and Anti Diuretic Hormone (ADH). If you sweat out more sodium and water then you are bringing in, Aldosterone is released to help reabsorb the sodium and water. Because your body is trying to keep a balance between sodium and potassium, Aldosterone is also forcing you to excrete potassium in your urine. When all of this happens, blood thickens, muscular cramping becomes more prominent and feelings of tiredness and an an inability to “think straight” gets compromised. Water intake and salt become absolutely critical particularrily for Action Sports athletes that train and compete in hot conditions. Let’s now look at some guidelines for salt and water intake for hard-working Action Sports athletes. Heavy sweating due to exercise requires equal replacement of fluids and salt. Since your body can loose up to two liters of water per hour in extreme conditions, and each liter can contain between 1 gram and 2 grams of salt, you can see just how much salt is needed to perform at an optimal level. To put this into perspective, a full teaspoon of salt contains around 2 grams of salt. If you’re out riding or racing all day, you could be drinking a gallon or more of water, and you would need four teaspoons of salt! Don’t shy away from salt if you are drinking enough water because if you do, you could be holding yourself back more than you ever thought.